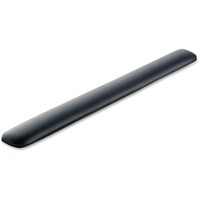 Stay in the zone with this wrist rest for keyboards. This 3M Workspace Solution enhances comfort and productivity for optimal performance. Like a satin pillow for your wrist, soothing 3M Gel Technology is firm enough to provide the support you need but soft enough for optimal comfort. Sleek profile uses minimal desk space and is very easy to pick up and move around.